Like the past couple of years, Andras Frenyo has invited me to join him covering the Sziget festival in fullscreen panoramas. Tomorrow is zero-day, but the festival does not really start until wednesday. I'll be leaving for Budapest tomorrow morning. I warned you about this: I am getting famous! I got featured on the front page of the blog of Dutch technology lifestyle magazine Bright! Read more about Wohoo, I am famous! When I've been working too hard on projects that take a lot of energy, I often indulge myself in doing something completely different (though Tessa would argue that it's still behind a computer, so it is not all that different). Last week I visited Photokina, the largest photography tradefair in the world. The IVRPA was offered a booth at the fair, and part of the deal that got us the booth was us covering the event in interactive, fullscreen panoramas. I set up a special site for this event, and to this date we have about 60 panoramas up (50 of which were posted during the event). I am currently in Copenhagen attending Reboot 8.0. 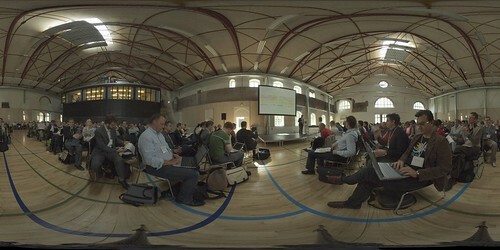 During the two day conference I'll be posting panoramas here. Since the conference is all about the social web 2.0 thing, I'm using Flickr and my new SPi-V for Flickr tool. It's been over a month since I returned from my odyssee. I have finally put some of the panoramas I took during the first leg online; the Portsmouth International Kite Festival 2005.